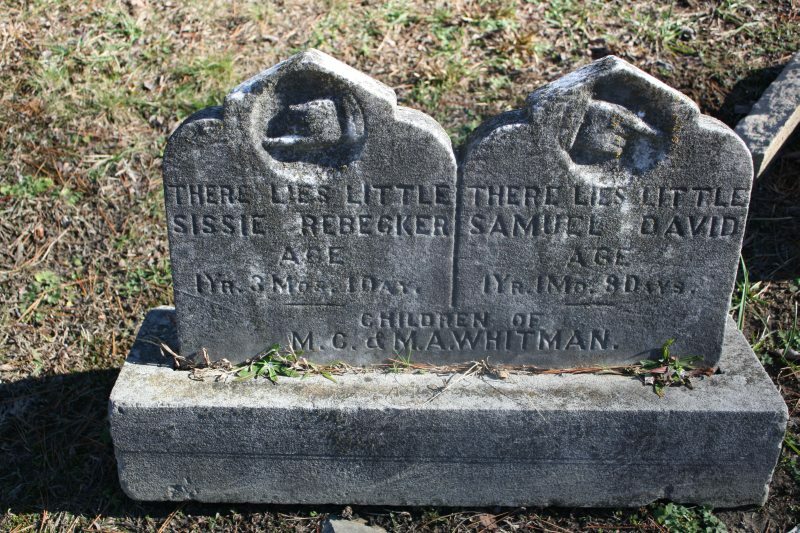 The Whitman children share a grave marker in Green Hill Cemetery. The stone features the hands-pointing- downward motif, which is usually found on the graves of younger people and could symbolize God reaching down to Earth to pluck up a life cut short. These fingers are unique because they point diagonally and the wording suggests that the hands might actually be pointing towards the individual graves instead of being placed there for symbolic purposes, even though both children died before reaching the age of two. Sissie was born on September 3, 1888 and died on October 11, 1889 from inanition. Inanition, or malnutrition, claimed the lives of many infants in the 19th century. This doesn’t necessarily mean that Sissie’s parents weren’t feeding her, it could have been that the milk or sustenance she was fed didn’t provide all of the required nutrients to sustain life. Samuel, born on October 18, 1893, lost his life to pneumonia on March 19, 1895. Interesting post! Sorry I'm late visiting. 🙂 It's interesting, too, that the fingers are pointing diagonally — very eye-catching! Next Next post: Fridays From the Mortuary Reports – "Falling Off a Brick Factory"